Posted by Megan Lewton on April 25, 2018 in News, Social Issues, Top Stories. A Ferris Title IX exhibit aims to debunk the stigma that what one wears can put them at risk for sexual assault. “What Were You Wearing?” is a week-long display that reveals recreations of outfits worn by survivors when they were sexually assaulted. The exhibit, located in UCB 116, is open 10 a.m. to 7 p.m. from April 23 through April 27. “It’s to battle the myth that what you were wearing somehow gives someone else permission to your body and a lot of people will think, ‘oh, well what were they wearing? Like, if they were wearing something scandalous, then it’s kind of their fault.’ No, that’s not even close to true,” Ferris forensic biology freshman and Title IX Student Assistant Heidi Stauffer said. 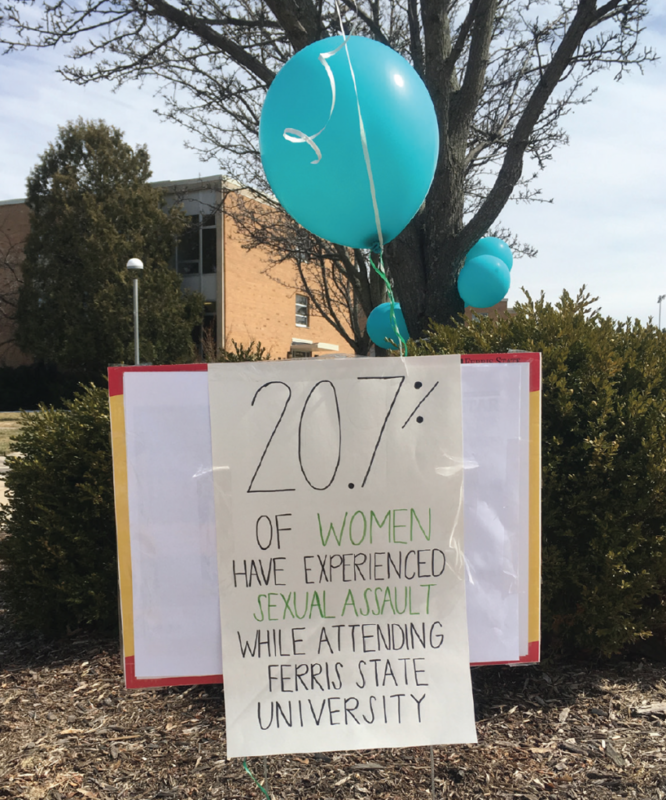 “What Were You Wearing?” is the final event of Sexual Assault Awareness Month at Ferris. A series of events regarding sexual assault awareness were held throughout April, including workshops and a march. The events were coordinated by Stauffer, Title IX Coordinator Kevin Carmody and Ferris technical and professional communication and Spanish for the professions senior and Title IX Student Assistant Harley Harrison. Student volunteers are available at the exhibit throughout the week to offer resources and emotional support to viewers. Among the volunteers is Ferris social work junior Nick Hadley, who is volunteering with the Social Work Association (SWA). “I think that the biggest thing that I’d like students to take away, specifically survivors, is that it’s not their fault, and people who aren’t survivors, I would just say that you can be supportive, and if you come here, you can get some of the statistics about how often it happens, and you just realize that it happens way more often than a lot of people think,” Hadley said. Stauffer hopes the exhibit will inform others about how significant the issue is. who have been sexually assaulted while attending Ferris. For more information, contact Carmody at KevinCarmody@nullferris.edu or visit the “Campus Needs You” Facebook page. Editor’s note: Title IX’s Sexual Assault Awareness Month series was organized by Torch News Editor Harley Harrison, a student employee of their office. In order to acheive journalistic objectivity, Harrison was not involved in the production of content for these events.